Well, the snow is over. But it’s sooo cold….I don’t know which is worse…Snow can be fun. The single digit cold isn’t. Yesterday traveling through mid-town Manhattan on a bus took ten times the time it usually takes to go from here to there….Of course, it WAS scenic…The Snow turning even the grittiest urban eyesore into something beautiful to look at…Piles of junked cars became artful sculpture in the white. But I did notice one thing. Neon doesn’t change in the snow. As my bus went SLOOOOOWLY through the Times Square area, the bright Neon signs were as garish as they’ve ever been and just as visible, just as readable. A mad, blinding blizzard in New York doesn’t stop the advertising from being read quite clearly. 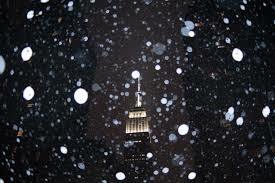 Skyscrapers, too, looked the same, although the swirling snow was visibly engulfing them, making their tops disappear into the white. So they seemed surprisingly shorter,in the mad swirl, but the Neon signs, no. The Times Square area continued its’ blazing, blaring,non-stop Broadway ballyhoo-ing. When it’s snowing it isn’t THAT cold out.It was around 30 degrees, or a bit less. 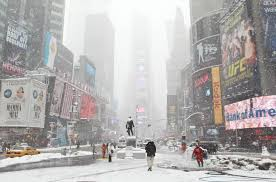 The snow changes everything in such a mechanical city as New York. It slows down into the slowest of motions and interferes with everything, except of course, the subways. As we approached Second Avenue, I heard on the bus’ intercom that a Select Bus, one of the new, super-long buses they’ve been introducing with a huge, accordion bend (or two) in the middle had “jack-knifed on Second Avenue.” I asked the bus-driver if the other buses were running on Second Avenue and he said he didn’t know. And I wondered if I should get out where we were Third Avenue, which I thought also went downtown. (It doesn’t.) And he said “I can’t tell you what to do. It’s up to you. You can take the risk.” Which left me completely confused. Thanks a lot. But I could see the traffic running, racing even on Second Avenue, so I thought “Well, the traffic certainly hasn’t slowed down. So the buses must be running.” They weren’t. I waited and waited on Second Avenue with dozens and dozens of other people. Bundled up they all looked like Russian peasants. The tired, the poor, the huddled masses, yearning to breathe free. The wretched refuse of your teeming shores, trying to get downtown. I ducked into the warm, friendly lobby of the WPIX building. I must’ve been there for over a quarter of an hour, then I finally decided to walk back from whence I came. To Third Avenue, where the buses also went downtown. Or so I thought. No. The traffic was all going uptown. And at that point I was seriously considering giving up and going home. But no. As I trudged into the driving white mess, I saw a colorful subway sign.My heart leapt! Civilization! So that’s what I did. I went down into the subway. I had never seen this entrance before, AND it had an escalator going down, so that’s what I did. And I eventually got where I was going. Moral of the story, when it’s a blizzard in New York City, take the subways. They NEVER stop. I should’ve taken the subway in the first place. The rain has completely stopped, as have the buses & subways…. The rain has completely stopped. At least for the moment. No thunder in the distance, as I heard briefly this morning, as I dashed about. And one thing that I DIDN’T do is at Whole Foods yesterday, I forgot to get my coffee beans GROUND!?!? Should I go out now and see if I can accomplish this before Irene makes it IMPOSSIBLE?? ?